Four-door luxury sedans meet in this head-to-head comparison. The 2019 Toyota Avalon and the 2019 INFINITI Q70 are priced differently, but they both have strong exterior design elements and comfortable interiors. They’re both loaded with value and style, but which one has the best all-around features? Here are two vehicles that should never meet each other in a head-to-head match-up. They’re both four-door sedans that aim to appeal to luxury vehicle buyers, but they have different approaches to the market. The 2019 Toyota Avalon was recently updated and hopes that value-based standard equipment trumps high-priced amenities. The 2019 INFINITI Q70 is in another class with an MSRP that starts over $50,000 and a dizzying array of options. The Q70 leads with performance capabilities and rests on the pedigree of a well-renowned luxury interior. It’s time to see if the 2019 Toyota Avalon stands a chance in this luxury sedan match-up. The 2019 Toyota Avalon does have some impressive vehicle design features. The front grill is the opposite of subtle with a wide, sweeping fascia that might remind you of the Lexus ES. The laser-like LED lights are also a nice touch. There are subtle vents on the front side bumpers, an available rear spoiler, rear diffuser and special panels under the body which reduce wind drag and add some sporting elements to the overall look of the vehicle. Those gill-like slits are reinforced by sharp slashes and folds all along the profile. The 2019 INFINITI Q70 is more curvaceous than the Avalon. The front grille appears tapered and small while the LED headlamps have an eyelid look that is quite unique. The profile of the Q70 is almost bereft of any hard lines at all. The lines are smooth and nearly vanish over the wheel wells as they sweep to the rear. The most glaring negative design element is the absence of design options. There are only five exterior paint palettes to choose from. One redeeming feature employs the Intelligent Key. When the Intelligent Key is within range, the Q70 seems to come alive and responds to your presence with an undulating pulse from the exterior lights. The 2019 Toyota Avalon comes with one engine option: a 3.5 Liter V6 that produces 301 horsepower and 267 lb. ft. of torque. Front-wheel drive is standard, and the powertrain is managed by an 8-speed automatic transmission. There’s also a hybrid motor system, but that’s not going to be covered in this comparison. The Touring model comes with Adaptive Variable Suspension and serves to keep the Avalon’s handling and steering rather rigid and sporty. Don’t be fooled by the Avalon’s available Engine Sound Enhancement, or ESE. It uses the audio system in the cabin to enhance the sound of the engine’s acceleration and exhaust. The drivers in the lane opposite of you might think you’re packing some serious heat under the hood, but it’s just an illusion. The ESE doesn’t actually do anything to improve performance. 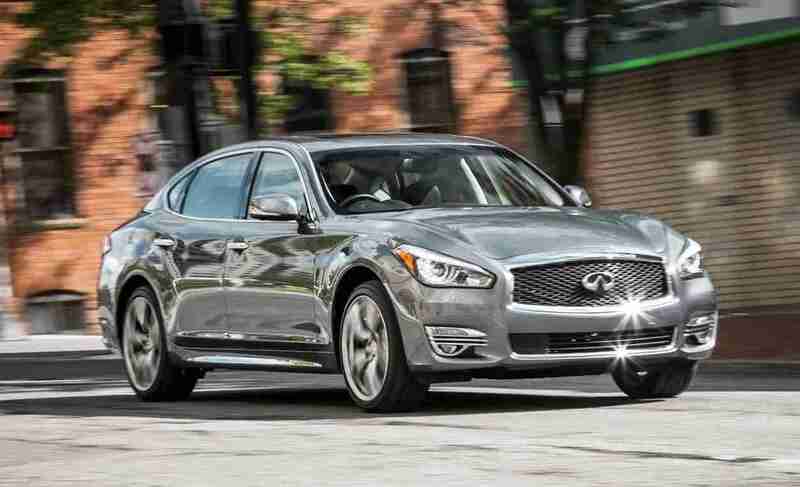 The 2019 INFINITI Q70 is a better performer and has more options. When compared directly to the Avalon, the Q70 is equipped with a 3.7 Liter, V6 engine that achieves 330 horsepower and 270 lb. ft. of torque. It has rear-wheel drive and a 7-speed automatic transmission that employs algorithms to match your driving style and shift patterns. A toggle inside the cabin lets the driver choose between different driving modes that influence the vehicle’s acceleration and handling. The Sport package upgrades the brakes and suspension for a more thrilling driving experience. Now, for the overkill. There is a second engine option: a 5.6 Liter, V8 engine that has 420 horsepower and 417 lb. ft. of torque. All-wheel drive is standard on the 5.6 liter model trims and when paired with the Sport package, the 2019 Q70 is light years ahead of the Toyota Avalon. The base model Avalon is roomy and has a driver-friendly layout. To get the most from the Avalon, you better take a closer look at the Touring and Limited model trims. 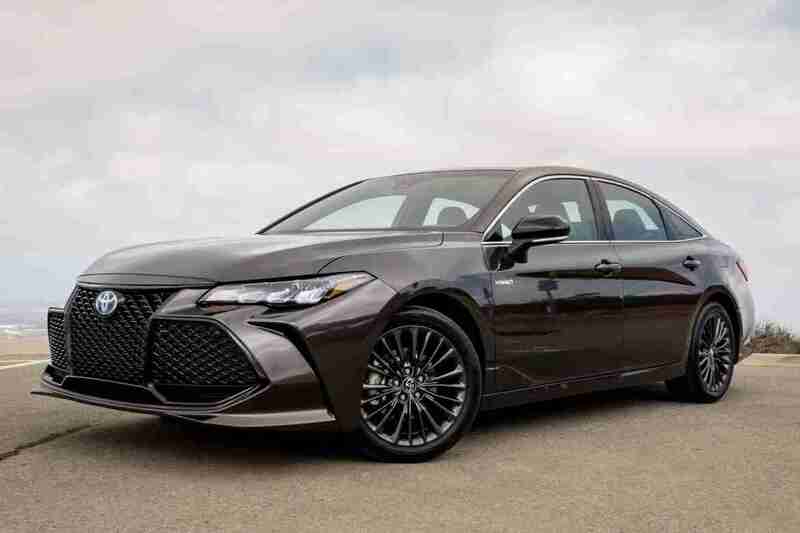 The 2019 Toyota Avalon Touring model has aluminium panelling while the Limited features Yamaha wood trim and quilted, perforated leather seats that dare to attain the throne of true luxury. The center console is the dominant feature inside the cabin. It’s 9 inches and is designed to float above the dashboard. Another winner for the Avalon is the generous 16 cubic feet of cargo space in the trunk. The 2019 INFINITI Q70 would be the obvious favorite for the interior amenities because it is a true luxury sedan. Although, the Toyota Avalon bests the Q70 in terms of cargo space (only 14.9 cubic feet in the Q70), rear seat passenger space and a slightly larger touchscreen. Yet, that’s the limit of what the Avalon can achieve against the best of the 2019 INFINITI Q70. The Q70 base model comes with leather seating, heated front seats, a leather-wrapped steering wheel, shift knob to match, and Japanese ash wood trim. The touchscreen interface is 8-inches but the controls are easier to navigate than the Avalon’s mix of redundant buttons. If the touchscreen is over-rated, then try the INFINITI voice control system. The available Sport package puts the nail in the coffin by adding 16-speaker BOSE audio, aluminum sports pedals and solid magnesium paddle shifters. The 2019 Toyota Avalon has a real opportunity to stand out when it comes to safety features. The standard equipment that you get with the Toyota Safety Sense is a true bonus. You get blind spot monitoring, rear cross traffic alerts, pedestrian detection, lane departure alerts, adaptive cruise control, a rear camera, and automatic emergency braking. The Limited trim does have an advanced safety package that includes advanced sonar detection and automatic braking for rear cross traffic, as well as an around view monitoring system. However, with all the standard safety equipment, it hardly seems worth it to opt for a pricier safety package. An around-view monitor that can even detect moving objects is standard on all 2019 INFINITI Q70 sedans. Yet, the most sought-after safety features are bundled into the pricey Proactive package. That bundle comes with Blind Spot warning and intervention, lane-keeping technology, forward collision warnings and emergency braking. These features are rapidly becoming must-have safety amenities on all vehicles, but INFINITI doesn’t offer them as standard equipment on any particular trim. Surprisingly, the 2019 Toyota Avalon actually does okay against the 2019 INFINITI Q70. Yet, it’s still punching above its weight class (in boxing terms). You would expect a Lexus to match-up against an INFINITI and a Toyota to be comparably matched-up against a Nissan, but that’s not necessarily the case here. There are seven Avalon model trims available, but only a fully-equipped Touring model comes close to the Q70s features and capabilities. Unfortunately, the Touring model and its V6 engine aren’t even in the same stratosphere as the INFINITI V8 or even the V6 engine and its supporting technology in terms of performance. However, the Toyota Avalon does get a nod for having better gas mileage. The INFINITI Q70 has a sophisticated body design, but the Avalon stays in its own lane with an aggressive and unique exterior all its own. The interior capacity differences are ever so slight, but INFINITI does excel at providing refined materials and impressive technology. Then, there’s the cost to own. The 2019 Toyota Avalon Touring model starts at $43,125 while the 2019 INFINITI 3.7 LUXE starts at $51,295. That’s comparing a high model trim Avalon to the base model INFINITI prices, but these are comparably-equipped vehicles. The price difference leans in the favor of the Avalon. All told, if you’re looking for a luxury sedan then the Q70 has all the trappings. It’s fast and upscale. However, the 2019 Toyota Avalon is much more affordable and still has some of the features that you’re sure to find on nearly any luxury sedan on the market. So, this head-to-head race goes to the 2019 INFINITI Q70 by a nose. Perhaps the Toyota Avalon should bring its big brother, the 2019 Lexus ES to the next head-to-head matchup.